By far Polour Camp is the best starting point for the south and the west route of Damavand mountain, unlike Reyneh camp it is a shortcut to base camp. This new complex sport center is made by Iran Mountain Federation and it has a hostel which looks like a comfortable hotel located in Polour village. - 2 private rooms or suites (with bunk beds, refrigerator, cold & hot water taps, shower and toilet in rooms. - 9 shared rooms with bunk beds. - Cold & hot water taps, shower. - kitchen, refrigerator and cooking equipments. Read more in Camp 1 Polour, Damavand Camp1 Polour FAQ. It is located on the southern flank of the mountain in Reineh Town, it is an ordinary old hostel. - 2 private rooms or suite with bunk beds. - 2 shared rooms with bunk beds. - Cold and hot water taps, shower. 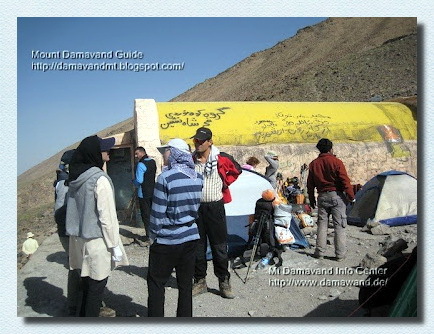 Read more Damavand Camp 1 Reineh, Damawand Camp1 Reyneh FAQ. There is a mountain shelter and a mosque which you may use. At the moment it has two old rooms, the doors and the windows are damaged and the rooms are not suitable for use any more! 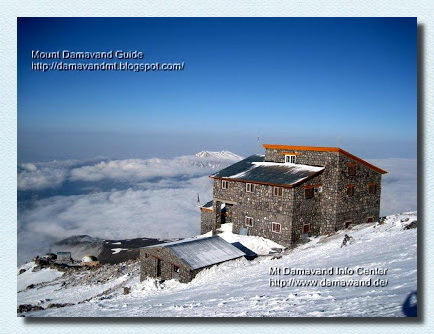 Read more Damavand Camp 2 Base and Damawand Camp2 Base FAQ. It has a vacant room, usually crowded in summer, the other rooms are occupied by local people! You may bring and use your own tent far from this area for better comfort and privacy. Remmember base camp is not recommended for accommodation in summer, because it is too crowded and too dirty, in fact it is invaded by local people, for acclimatization instead of this campsite, it is much better to use Camp1 Polour, Camp3 Bargah or Camp3 New Hut. The New Hut in camp3 is the best place for accomedation in the area. It is comfortable and safe in case of bad weather. There are private and shared rooms with bunk beds. 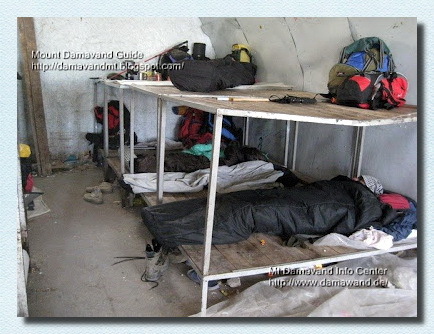 Damavand Camp3 New Hut FAQ. - One big shared saloon with bunk beds. - kitchen and cooking equipments. - No central heating it is quite cold especially at night. - Runing water in summer. - Some food and drinks. - Mobile network available is some area. 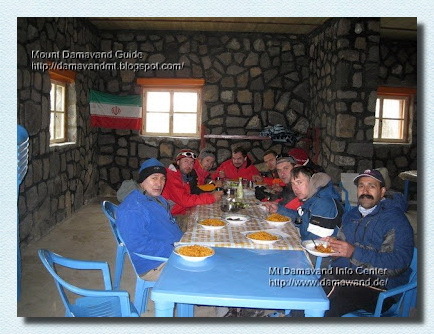 Read more Camp 3 Old Shelter, Camp 3 New Hut, Damavand Camp3 Shelter FAQ. - Remember that there is in no hut, resort or hostel in other routes of Mt Damavand and you have to use shelter/refuge or tent only. 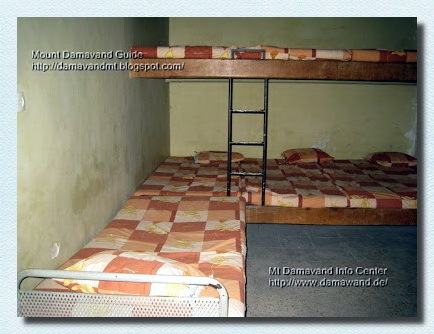 - bunk beds = two beds, one above the other, 2 stage beds. It is a good resting place for off season only, remmember this shelter is not suitable for use in summer because it is too crowded and too noisy. You may bring and use your own tent for better comfort and privacy or rent a tent in summer. Unterkunft Damavand Süd-Route. Berg Verband der Iran Campingplätze. Klettern und Skitouren 2015 Camping und Zelten im Iran Verband Campingplatz, Resorts und Unterkunft. Eco Reisen und Tourismus Teheran. Persischen kulturellen und historischen Führer. Outdoor-Freizeitaktivität, Bakhtiari und Qashqaei Nomaden Touren. Berggebiete und die Berggemeinden. Damavand Foto. Unterkunft in Iran, Hotel, Hostel, Camping, Hütte und Lodge. Unterkunft Damavand Campingplätze, Berg Föderation, Iran Resorts, Klettern und Skitouren. 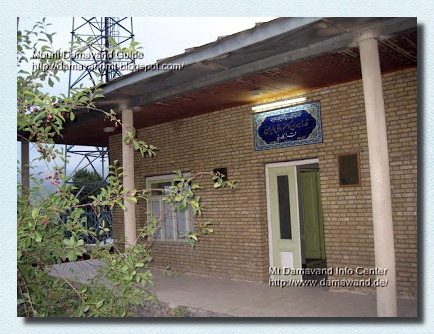 Accommodation Damavand South Route. Mount Federation of Iran campsites. Climbing and skitouring 2015. Camping and tenting in Iran federation campsite, resort and lodging. Eco touring and tourism Tehran. Persian cultural and historic guide. Outdoor recreation activity, Bakhtiari and Qashqaei nomad tours. Mountain zones and the mountaineering communities. Damavand Photo. Accommodation in Iran, hotel, hostel, camp, hut and lodge. Accommodation Damavand Campsites, Mountaineering Federation, Iran Resorts, Climbing and Skitouring. 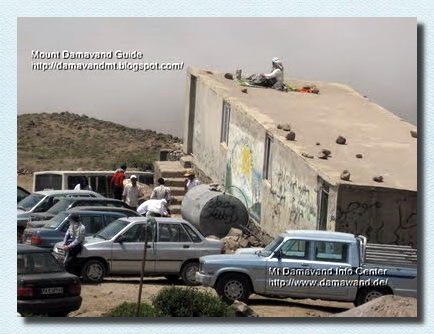 Alojamiento Damavand Ruta del Sur. Monte Federación de campings Irán. Escalada y skirando 2015. Camping y tienda de campaña en Irán camping federación, resort y alojamiento. Eco turismo y turismo Teherán. Guía cultural e histórico persa. Actividad de recreación al aire libre, Bakhtiari y Qashqaei giras nómadas. Zonas de montaña y las comunidades de montaña. Foto Damavand. Alojamiento en Irán, hotel, hostal, campamento, refugio y albergue. Alojamiento Damavand camping, Federación de Montañismo, Irán Resorts, Escalada y Skirando. Hébergement Damavand Route du Sud. Fédération Mont des campings Iran. Escalade et rando 2015. Camping et tentes en Iran fédération camping, station et le logement. Eco tourisme et le tourisme Téhéran. Guide culturel et historique Persique. Activité de loisirs de plein air, Bakhtiari et Qashqaei visites nomades. Zones de montagne et les communautés de montagne. Damavand Photo. Hébergement en Iran, hôtel, auberge, camp, cabane et lodge. Hébergement Damavand Campings, Fédération Alpinisme, Iran Resorts, Escalade et Randonnées à.
Alloggio Damavand South Route. Monte Federazione di campeggi Iran. Arrampicata e sci-alpinismo 2015. Camping e tenting in Iran campeggio federazione, resort e alloggio. Eco turismo e turismo Teheran. Guida culturale e storica persiana. Attività ricreative all'aperto, Bakhtiari e Qashqaei tour nomadi. Le zone di montagna e le comunità alpinismo. Damavand Foto. Alloggio in Iran, hotel, ostello, campeggio, rifugio e lodge. Alloggio Damavand Campeggi, Federazione Alpinismo, Iran Resorts, Climbing e Sci alpinismo. Overnatting Damavand South Route. Mount Federation of Iran campingplasser. Klatring og skitouring 2015. Camping og telting i Iran federation leiren, resort og losji. Eco touring og turisme Teheran. Persiske kulturelle og historiske guide. Friluftsliv aktivitet, Bakhtiari og Qashqaei nomade turer. Fjellsoner og fjellklatring samfunn. 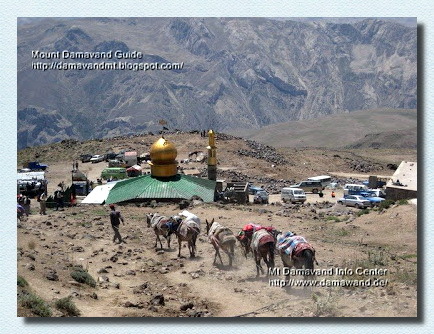 Damavand Photo. Overnatting i Iran, hotell, herberge, leir, hytte og lodge. Overnatting Damavand Campingplasser, Mountaineering Federation, Iran Resorts, Klatring og Skitouring. Размещение Damavand Южная маршрут. Гора Федерация Ирана кемпингов. Альпинизм и skitouring 2015 Кемпинг и места для палаток в Иране федерации лагеря, курорт и проживание. Эко путешествий и туризма Тегеран. Персидский культурный и исторический путеводитель. Открытый рекреационная деятельность, Bakhtiari и Qashqaei кочевые туры. Горные зоны и альпинистские общин. Damavand Фото. Размещение в Иран, гостиницы, общежития, лагеря, хижины и домик. Размещение Damavand Отдых, Федерация альпинизма, Иран Курорты, Альпинизм и Skitouring. 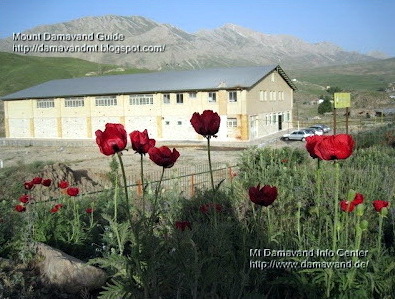 Razmeshcheniye Damavand Yuzhnaya marshrut. Gora Federatsiya Irana kempingov . Al'pinizm i skitouring 2015 Kemping i mesta dlya palatok v Irane federatsii lagerya , kurort i prozhivaniye. Eko puteshestviy i turizma Tegeran . Persidskiy kul'turnyy i istoricheskiy putevoditel' . Otkrytyy rekreatsionnaya deyatel'nost' , Bakhtiari i Qashqaei kochevyye tury . Gornyye zony i al'pinistskiye obshchin. Damavand Foto. Razmeshcheniye v Iran , gostinitsy, obshchezhitiya, lagerya, khizhiny i domik. Razmeshcheniye Damavand Otdykh , Federatsiya al'pinizma , Iran Kurorty , Al'pinizm i Skitouring .